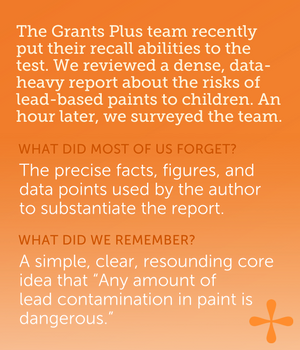 A successful grant proposal needs sufficient data and detail to be credible and complete. But while facts and figures are necessary to strengthen your proposal, they alone don’t win the grant. What can set your proposal apart is a clear, compelling, and unifying narrative thread that makes clear to the reader how your organization’s work is important, urgent, unique, and deserving of funding. How is this practical in the context of grant writing? Can a grant writer deliver a succinct, simple, core idea when a grant proposal demands so much information? 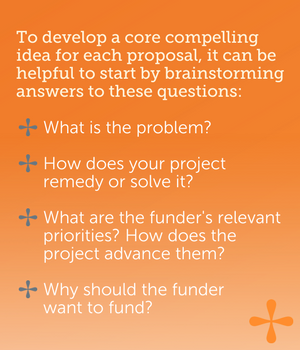 The answer is that a grant writer not only can, but really must, anchor a grant proposal around a core compelling idea to stand a better chance of cutting through the competition for grants. Consider how the funding process works in many foundations: the program officer reviewing your proposal is also reviewing many others, all that are stuffed with large amounts of information. She or he is responsible to boil down the main ideas of each proposal, to summarize what’s most important for a board of trustees who will decide on funding. The program officer will likely forget the specific facts and figures they read in your proposal, but what they’re more likely to remember is a sticky core idea. An hour after reading, what is the bottom-line impression or message that you want him or her to remember? The following examples demonstrate the core compelling idea in action. Executive Director Jennifer Scofield was challenged to demonstrate to funders the unique contributions of the Greater Cleveland Hunger Network as compared to Northeast Ohio’s flagship food bank. While the food bank is the region’s largest distributor of food, by managing the volunteers who operate area food pantries, the Greater Cleveland Hunger Network is the region’s nourisher of people. Food awaiting distribution in a box or on a shelf does not feed a community. It is in transferring food to hungry people that it becomes nourishment. This concept isn’t complicated—rather, it’s because the idea is intentionally simple but powerful that it calls the reader’s attention and is likely to stay in their mind. That’s just the effect that Jennifer saw on funders as she began to anchor her grant proposals around this core compelling idea. “The response I was getting from program officers was ‘Oh—now I get it.’” Over the last year the Hunger Network has gained traction with new funders along with new and increased grant dollars. Lake View Cemetery Foundation succeeded at crafting a core compelling idea to motivate funders to invest in restoring the Garfield Memorial—a soaring tribute to President James A. Garfield, Ohio native and 20th president of the United States, who was assassinated four months into his presidency. A grant writer could present the expected: a cut-and-dry capital request for bricks and mortar to repair the monument. But Lake View took a bolder approach. With help from Grants Plus, they identified what is actually likely to motivate and even excite funders: Cleveland. The Garfield Memorial is a symbol of Cleveland’s rise, fall, and revival that should be restored out of civic duty and pride in our city’s past and future. By investing in this restoration campaign, the Foundation will protect the Garfield Memorial as a source of pride and lasting symbol of Cleveland. It would not befit our pride in our city, or in our fallen president, to allow the Garfield Memorial to fall into disrepair. As we pursue these public enhancements, the final resting place of the only U.S. President from Northeast Ohio must not be overlooked. The core compelling idea manages to transform what could be a dry, uninspiring capital request into an evocative call to action. You, and later your reader, should be able to distinguish the compelling idea at the core of every grant proposal you write. When you step back from the details, what will stay with the reader? Think of the core compelling idea as the overarching theme of your grant application that conveys how your organization makes a powerful difference and what sets it apart. It is the answer to why the funder should want to fund your request, so that through their investment they can see their own mission come alive in the world. It is tailored to the funder: Discovering the core concept for the Garfield Memorial started with recognizing what matters to funders. Your core compelling idea should vary from one application to another based on the priorities of the specific foundation. Imagine you are a food pantry preparing two grant applications. The first funder’s key concern is child hunger. The second funder’s interest is improving academic outcomes. Your description of your organization and programs will likely be very much the same between the two proposals. But the core compelling idea the proposal is anchored around will be different: for the first funder it should be centered on ending child hunger, and for the second it should make the link between food access and education. It’s declarative: There’s an emphatic energy to the examples from Hunger Network of Greater Cleveland and Lake View Cemetery Foundation. They don’t just summarize, but declare something of interest. They confidently convey a point of view—fitting, since after all, a grant proposal should be a persuasive document. It gets repeated: By reinforcing the core compelling idea in different words and different places throughout the proposal, the concept is more likely to stay with the reader. The grant writer of the hypothetical proposal about hunger and academics would want to reiterate in several places why hungry children struggle to learn and how providing access to food can improve academic outcomes. Don’t leave it to a busy program officer to deduce and later recall what’s most important from your proposal. Make his or her job easier, and your own chances of funding greater, by making sure your proposal is one that sings clear and true with an unmistakable and unforgettable compelling idea at its core.